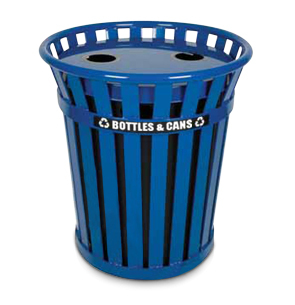 A perfect addition to the Wydman Collection, this 36 gallon recycling receptacle features the same styling, but with a reinforcing circular band which displays a "Bottles & Cans" decal. Durable, long-lasting flat bar steel construction deters graffiti. Blue flat top lid has two circular cutouts to signify segregated trash disposal. Anchor kit includes hardware for surface mounting. Powder-Coated blue. Lid Cable Attachment Kit Supplied.